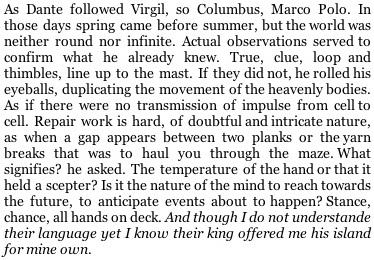 As Dante followed Virgil, so Columbus, Marco Polo. In those days spring came before summer, but the world was neither round nor infinite. Actual observations served to confirm what he already knew. True, clue, loop and thimbles, line up to the mast. If they did not, he rolled his eyeballs, duplicating the movement of the heavenly bodies. As if there were no transmission of impulse from cell to cell. Repair work is hard, of doubtful and intricate nature, as when a gap appears between two planks or the yarn breaks that was to haul you through the maze. What signifies? he asked. The temperature of the hand or that it held a scepter? Is it the nature of the mind to reach towards the future, to anticipate events about to happen? Stance, chance, all hands on deck. And though I do not understande their language yet I know their king offered me his island for mine own.